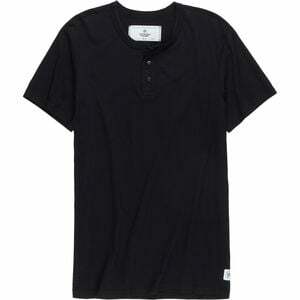 Product Condition: The Henley Shirt - Men's is in Good condition. This was owned for two weeks and saw little use, it looks very nice. There is some lint and pet hair on it, but a washing will have it looking as good as new. Get a great deal on this shirt today! *Sold as is, all warranties void. With a hint of retro-inspired style and full-spectrum comfort, the Reigning Champ Men's Henley Shirt offers a rustic vibe that pairs well with your sweats or your go-to dark denim. The Henley features a short-sleeve design, allowing you to wear it from spring into fall, while the cotton fabric ensures day-long comfort.